Government should not allow Centrelink Agents, Police and NSW Health to carry out Malice acts against Citizens for Complaints. I have had a complaint regarding Centrelink and Menindee Contracted Centrelink Agent since December 2010. This complaint has never been resolved and the Ombudsman Determination has discriminated against me in the use of the Menindee Centrelink Agency since. This discrimination continued through Murdi Paaki (Remote Jobs and Communities Program) under the Portfolio of Tony Abbott (Prime Minister and Cabinet) and resulted in me having no choice other than to estrange Centerlink and Murdi Paaki in July 2014 in order to prevent further Malice Revenge, illegalities and falsified breaching causing harm. In July 2014 Tony Abbott (PM&C) formally advised in writing they will not accept further contact and all further correspondence will be filled without acknowledgment. 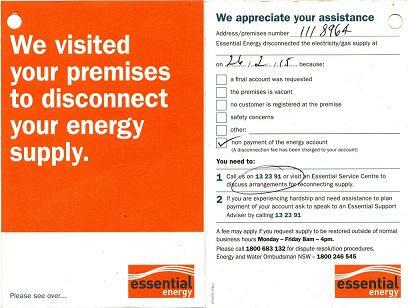 Without money power was disconnected by NSW Government owned Essential Energy 4 months ago in Feb 2015. My experience is detailed in this website page and linked Scribd.com (Publishing Site) Documents Below. I am calling on the Australian Public to demand our human and legal rights. Centrelinks Secret Breaching Triggered Death Toll; No more deaths for politics. The Members of this Group believe that Private Companies, Government Contracted Companies should be stopped from scamming for illegally obtained Commonwealth monies above human life!